The more I learn to cook better food the more I realize that I can make my food amplified if I serve the right drink with it. I dont drink very often but when I do its wine. Each year when the state fair is running we stop in the Wine Gardens to try new wines. The cheese and fruit plates they serve with the wine are delicious. I find it enjoyable to try wines from different regions too. I had not thought about Australian wines until a friend of ours married an Australian woman and they told me about the sun and soil there makes for some great wines. Cooking with wine can be a tasty way to add flavor to a dish. Wine Selectors has a variety of white wines that pair well with seafood and reds that go with beef. I found one that sounded very interesting, Angullong Savagnin. The Angullong promise is to deliver wines of great regional character thanks to their cool climate vineyards planted on ancient volcanic soils with flavors if passionfruit and honeydew melon aromas and tangy tropical fruit with a herbaceous twist on the palate, thats sounds wonderful! They even have a section that list wines that are perfect for a BBQ, how great is that. The drop down list for the types of meat you are eating make it simple to know what wines to pair with your food. Everything from lamb, seafood, pork, beef, chicken and dessert. If you cannot decide what wine to buy for your recipes you can buy a mixed shipment of a variety of wines in a range of budgets. I think it would be fun to serve my guest this holiday season wines from Australia. 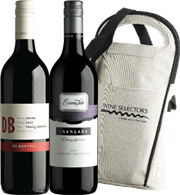 You can also enter the current contest running on the Wine Selector website to win a case of premium wine. I have not served wine with dessert. It sounds like an elegant touch to a dinner party. I found a 3 pack that sounded great. The wines have hints of lemon rind over rich butterscotch with toffee and rich butterscotch and apricot nectar, just the wines sound like a great dessert! I look forward to trying new wine pairings with food. *This post is brought to you by Wine Selectors. The opinions are 100% mine and may vary from others.